Nancy Garcia of Boyle Heights was working at Goodwill when she first learned about Women Build Metro. At the time, she wasn’t sure the Goodwill store was a good fit for her. So when she saw the flyer for last year’s Women Build Metro Los Angeles symposium, she decided to attend. A career in construction wasn’t something she had ever considered, but she wanted to explore all the options available to her. At the symposium, Nancy was able to hear from real women who worked in construction, from administrative work to operating heavy machinery. She was particularly inspired by one woman’s story — a woman who had been working as a restaurant server before becoming a carpenter. Hearing the woman’s journey gave Nancy the confidence to do the same, and Nancy is now a carpenter apprentice working on the USC campus. Her days on the job site involve pouring cement for sidewalks, stairways and water fountains. While the work is labor intensive, she finds it fulfilling. With her new job, Nancy is able to take care of her family, and she’s now considering taking some night classes. She’s hoping to become a certified welder, and wants to learn more about other trades as well. 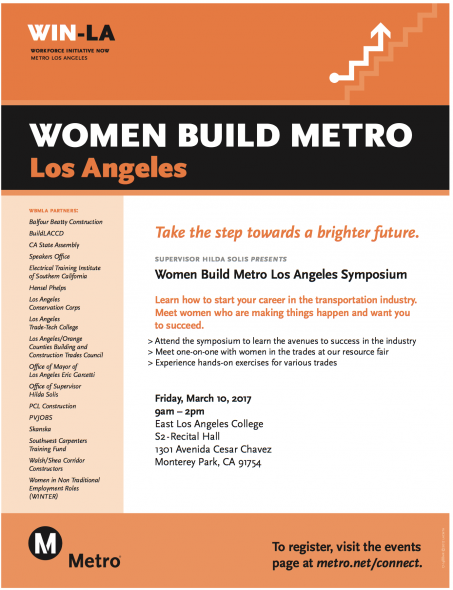 The next Women Build Metro Los Angeles Symposium takes place on Friday, March 10, at East Los Angeles College. For more information or to register, visit metro.net/connect.